Here’s how to make your own greeting cards for St. Patrick’s Day, using a shamrock motif that you create with cut outs, confetti or stickers. Cut a piece of white card stock paper to desired size and fold in half. Before you begin attaching anything to your card, lay all of the pieces in place until you are satisfied with the results. Now, that you are happy with the layout begin gluing your pieces in place. For the first card, I simply cut out the centre of a shamrock doily and glued the shamrock in place. I then glued confetti shamrocks around the outside edge. For the second card, I tied a small green ribbon bow and glued in place. I then attached a couple of small shamrock stickers just below and above the bow (refer to photo for placement). I used acrylic paint, but you can use markers or crayons, etc to write “Happy St. Patrick’s Day” or what ever greeting you prefer. 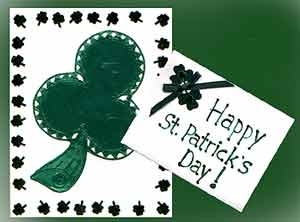 These greeting cards can be made by even the youngest children and they make St. Patty’s a little extra special.